On a sunny mid-morning of March at the downtown tourist bus terminal, about 10 people wearing yellow-green vest with the word “Staff” across the front are walking around and checking various lists again and again. Suddenly, they check their watches, swallow hard and ready their perfect beautiful smiles for the arrival of the long-awaited tourists. Ms. Madoka Harvey works as a staff when a cruise comes to Kochi and always faces some trouble every time she guides the tourists. “Even if the schedule has been arranged months before, everything won’t go smoothly.” she said. “The reception of luxury liners has just started recently.” the chief of port promotion division department Ms. Reiko Mitani said. They are still in the trial and error stage. “We are working on it,” she continued. The Kochi-Shinko (Kochi new port), which is about 20 kilometers away from the center of Kochi city, was opened for freight transport in 1998. 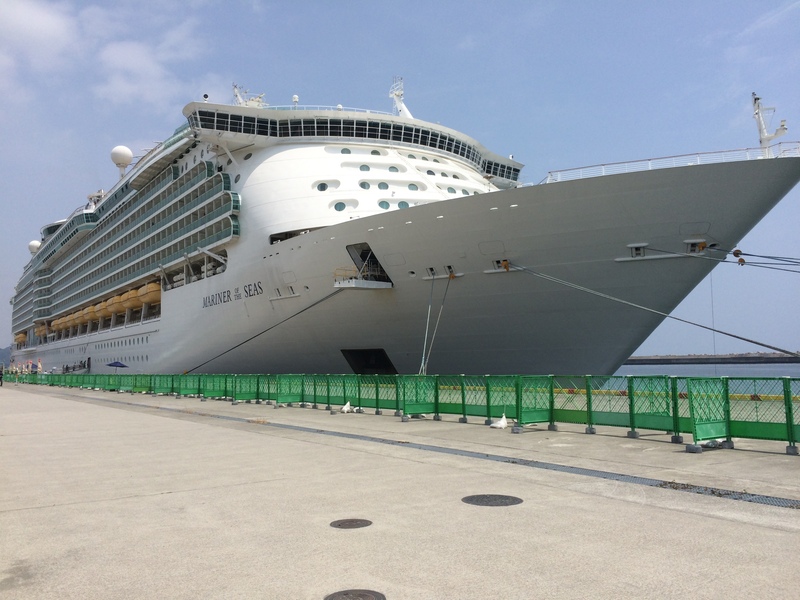 Since May 2014, Kochi prefecture started accepting overseas cruise ships. The number of these cruise ships coming to Kochi is increasing and becoming a new source of income to the local economy. When the cruise tourists arrive in port, most will ride the free shuttle bus provided by the prefectural government, and head to the Harimayabashi tourist bus terminal. As soon as they arrive, they will start to stroll through the small town and visit popular spots such as Hirome-ichiba, Nichiyo-ichi, and the Kochi castle, before returning to the ship. Local Kochi people might say, “There is nothing to do in Kochi.” But if so, why is tourism increasing? According to Ms. Mitani, as the cruise ships from all over the world visiting Japan are increasing, and those ports in Nagasaki, Hakata, and Hiroshima which are the major places to stop are getting too full. “Well, fortunately, Kochi is in the good location, and the prefecture was very willing to welcome the tours, so the reception has started.” she gently smiled. Mr. Seigo Nishimori is also one of the staff of port promotion division department and very hopeful to the advantages which cruise ships brings to the prefecture’s economy. “The average number of people visit at one time is around 2000 to 3000. Let’s say that tourist uses 10 thousand yen each for food or souvenirs. It will be a great number, isn’t it?” he wondered. It is clear the cruise ship tourist reception system. Mr. Nishimori and Ms. Mitani both mentioned the problems yet to be worked out. “There are also many tourists who are visiting Kochi on their own. Sales clerks can’t just focus on the tourists from the cruise ship,” Mr. Nishimori insisted. “We can’t inconvenience other regular costumers just because a cruise ship pulls into port,” Ms. Mitani added. Another concern is language. As it is an overseas luxury liner, people on the cruise ship comes from several countries in all over the world, including Europeans, Chinese, and some Japanese. The problem is that the number of foreign language guides in Kochi are not enough. How can about 20 guides manage more than hundreds of tourists at one time? The prefecture is cooperating. There is a volunteer tour guide group called ‘Kochi SGG Club.’ SGG stands for Systematized Goodwill Guide. This group help whenever the cruise ships come. There is also a group of high school student’s voluntary helping to guide the tourists, too. It is hopeful that these kinds of groups will increase. The last but not the least problem, is that the time the ship stays in Kochi is limited to about 5 hours, and tourists can only visit few places in Kochi. According to Ms. Mitani again, if it is possible, the staff really wants to show the tourists other beautiful places in Kochi. This year, Kochi-shinko will accept more than 30 cruise ships. One of them is the Queen Elizabeth which is 347.08 meters long and very luxurious. The number of cruise ships visiting Kochi increases four times in only three years. From now on Kochi-shinko is going to play an important role in tourist industry of Kochi. In the early afternoon, tourists are on their way to make a line due not being late to ride the ship. Many have both hands full of shopping bags, and big smiles on their faces. “BU-BU-BU, PI-PI-PI,” the big horn sounds. People are waving with a very big smile to the ship leaving. Cheers to the all Kochi staff. They are finally free! Cruise ship brings local areas big benefits and There exists many hardships to go schdule smoothly.I hope it lasts forever. It tells me how important to welcome other people who came from other cultures. I was impressed the stuffs’ hard working. Even though there are still several problems, Kochi Shinko Aare being as gatemen to welcome those who come all over the world. Surely it lead to a great success in Kochi’s economy. Kochi-Shinko is opening the door for all over the world! I want them to develop more and more. Wow! How big this cruise ship is!! I want to see with my own eyes someday. Great article!! I can’t imagine that those cruse ships bring benefits with a large ship. Great story. I didn’t know such a big cruise was coming in Kochi. I learned that it plays an important role for a connection between Kochi and foreigners!